This wonderful church was built at a stage when there was much ferment on this island. In 1967, the Second Vatican Council had finished in December 1965 – and Ireland had just celebrated the 50th anniversary of the Easter Rising. I was an optimistic teenager then – and we had no idea of the conflict that was soon to break out just a few miles away from here, a conflict that would last for 30 terrible years. The building of the new St Aengus' Church – or Burt chapel - was a sign of confidence and hope, whatever the unknown future would hold. 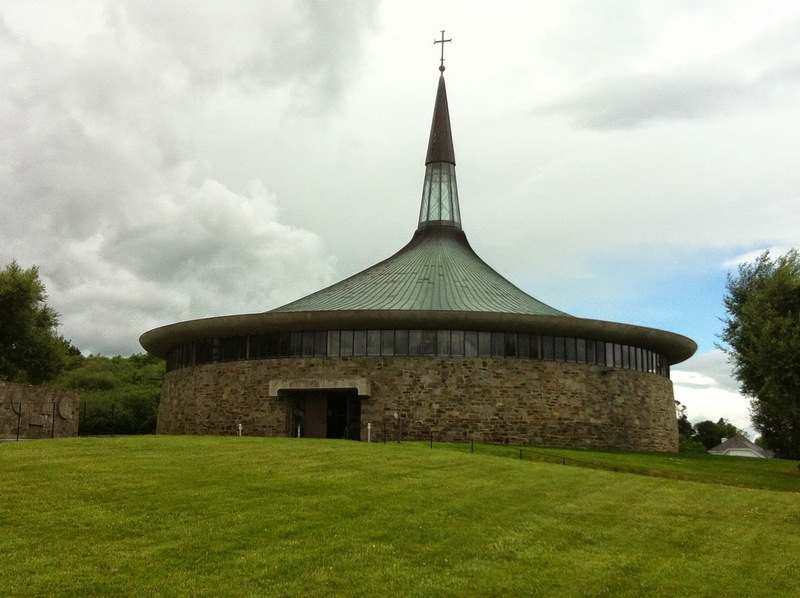 Only a vibrant community would have employed the local man who was the premier Irish architect of the day – and allowed him to imagine a completely new type of church. Here, Liam McCormick developed a sacred space that reflected the history of the area, the beauty of the environment, the quality of local materials and the skill of craftsmen – and still pointed a finger to the sky. So today we celebrate a people of faith who, for centuries, have tried to make the presence of God tangible in the middle of the humdrum and the spectacular, the happy and the tragic, the mystery of life and death, the beauty of faithfulness and forgiveness. Faith in Jesus never seeks to escape from the world – but acts to transform it through love. A faith that does not walk the roads of life with people is not following in the footsteps of the carpenter from Nazareth. Equally a culture that tells us to live in an increasingly virtual world, judging everything by what suits me, betrays the deepest needs of human hearts and offers us junk instead of chicken soup for the soul. So today is an opportunity to reflect on the wisdom of the past and the needs of the present as we try to build a world that will bless rather than endanger our precious young people. Firstly, this building reflects the Vatican II emphasis on the People of God, gathered around the Lord who feeds them each week with his Word and Sacrament. Building community is not easy in a world where individualism is underlined. But the building on the hill above says something about what sort of community we are, here in its shadow. The Grianan of Aileach was constructed so as to enable people to see far in all directions. It was not a place merely for hiding to keep out the baddies. Similarly, this church is here to welcome and enable people to become disciples of Jesus Christ, that is, people who are constantly learning from him. Among Jesus' last words to his apostles was the command to 'go make disciples'. We have had a model of church in Ireland where a lot of people went to Mass – but had no interest in growing as disciples, learners at the feet of the Lord. And we have often preferred a maintenance model of providing religious services. But, in2017 a diocese or parish that is not actively geared to making disciples and then forming them in the faith is not really Catholic. It is closer to being a holy hospice, waiting for death. Parishioners who have stopped growing in the faith are dying. People in church who talk mainly a miserable story of demise and closures are not disciples of Jesus. They are like the two men on the road to Emmaus who are more concerned with the nightmare of their own failed plans than dreaming God's plan. Pope Francis calls them 'disillusioned pessimists, sourpusses'! (EG 85). They bring no joy or hope. And the community of disciples that gathers in our churches are to be formed, not to defend their fortress, but so that they can be a missionary people. Being formed in discipleship means being trained to let others know what it is that is so important in our lives. Our parishes have been wonderful at supporting the missionaries who went overseas. This generation has lost much of that urgency to spread the Gospel which drove thousands to go to mission lands. As we celebrate 50 years of this church, we have to rediscover that generous energy – and direct all that we do in every parish to forming disciples and sending them out to bring good news and healing to so many in our own country whose lives are marked by pain and loss. It was precisely from that sort of fear-ridden upper room that the Holy Spirit chased the disciples on Pentecost Sunday. Secondly, you can see the Grianan of Aileach from far and near. Just by being so visible, it keeps reminding people of its presence. Similarly, this beautiful church is not here just to be visited by students of architecture. As traffic races past, the church is here to point to God, to the Transcendent in our society. A society without a spiritual life will die from cultural claustrophobia. It was Cassius Clay who is alleged to have said, "I don't want pie in the sky when I die. I want my pound on the ground when I am around". But an excessive preoccupation with looking down at the ground is causing too many to die for want of a reason for living. An excessive preoccupation with me encourages emotional immaturity. The myth of salvation by maximum individual freedom and maximum pleasure is ruining both our physical ecology and our human ecology. So the spire of this church is a pointer, not just to the existence of the divine but to the real liberation that we can aspire to through grace. In this country, we are increasingly encouraged to put our faith on what we can have, rather on what we can be. Jesus invites us to be heroic, not self-serving. Burt chapel is just one of the beautiful reminders that we are called to witness the infinite God in spirit and truth – and only thus can we become fully human. The pound on the ground while I am around may fill the pockets but its drains the heart and does not nourish the spirit. Thirdly, the people who build this Church were walking in hope, looking back in gratitude and looking forward with confidence in God. This building will eventually fade and fall, just like so many other churches before it. For a Church building is not a museum to the past but a pointer that we can look to the future. What that future will look like is not my concern, for the Church is Christ's body and its future is in good hands. So our celebration today is looking back over 50 years but it asks what legacy we are leaving to the next generation. Will they look back on us a people of courage, as we look back on hard times when faith was forbidden and there were no churches? Or will they regret that we failed to sow seeds of hope so that they could reap a harvest of grace? Will they thank us for having spoken the truth in love – about our own failings and about the message of the Gospel? Or will they ask why we failed to go to the peripheries of our society and got trapped in the fortress of our own fears, afraid to engage with the thousands who travel past seeing our beautiful building but never hearing us? There is much to celebrate today - the courage of the past, the faithfulness of so many and their generous commitment to Christ. 1967 marked the beginning of a new period in the history of the church, locally and universally. Can we renew our dedication to be courageous and undertake the changes that the last 50 years have thrust upon us? Disciples of Jesus don't complain about the present. They simply ask what the Lord wants us to do in this new environment. And we find our strength in the Mass. St Thomas Aquinas expressed beautifully how the Eucharist joins up the past, the present and future. and a pledge of future glory to us is given. . It is around the altar that we become a Eucharistic people, geared for mission and eager to go out. Our profession of faith invites us to be not a fortress but a powerhouse. As we face the next 50 years, can we start planning, not just to maintain the building of the century but to be the parish of the century? Anything less would be a betrayal of our rich and beautiful heritage. Christopher West is coming to Ireland!